In May 2014 I commented on a Paestan krater acquired by New York's Metropolitan Museum of Art after it had been identified by Dr Christos Tsirogiannis in photographic images seized from Giacomo Medici. Tsirogiannis published his full concerns in the Journal of Art Crime in 2014, but it has taken a further three years for the museum to respond. 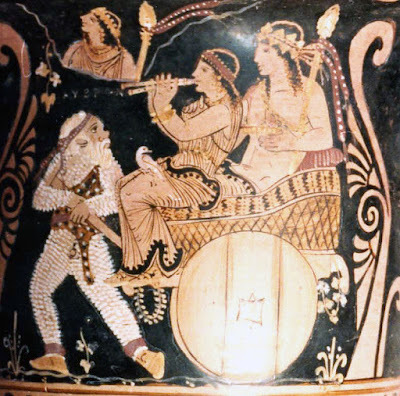 The krater showing Dionysos in a hand-drawn cart was purchased in 1989 from the Bothmer Purchase Fund (details from the Museum's website, inv. 1989.11.4). The krater surfaced through Sotheby's New York in June 1989. It is unclear who consigned the krater to Sotheby's New York. It has now been revealed that the krater has been handed over to the US authorities after a warrant had been issued (Tom Mashberg, "Ancient Vase Seized From Met Museum on Suspicion It Was Looted", New York Times July 31, 2018). The Met, for its part, disputed the suggestion that it had ignored warnings about the vase. Officials said the museum had noticed Dr. Tsirogiannis’s published research in 2014 and, indeed, had been troubled by the reappearance of Mr. Medici’s name in connection with an artifact. They said they reached out informally to the Italian authorities then, but received no response. The museum said that in December 2016 it sent the Italian Culture Ministry a formal request to resolve the case. The Met said it was awaiting guidance from the Italians when Manhattan prosecutors alerted it in June to their own concerns. It is to be welcomed that the museum has eventually responded to academic concerns. It is a reminder to other museums that are holding material identified from the Becchina, Medici and Symes photographic archives that they need to engage with the due diligence process and to act ethically and professionally.